Ocean Falls is a small town located on the rugged Canadian west coast of British Columbia. During its' lifetime the town has experienced several major changes. The town started as a small sawmill town in the beginning of the 1900 but later developed into an important pulp and paper mill town. The pulp and paper mill was operated by various owners right into the beginning of the 'eighties. Nowadays, the town is again a small town. However, the Ocean Falls of the past still exists in the memories of the thousands of people who once made this town their home. Ocean Falls was quite a special town and it strongly influenced all who lived there. In spite of its' isolation and the exposure to one of North America's highest yearly rainfalls, Ocean Falls supported a large paper mill, a sizable town site and a thriving community. Ocean Falls is located at the end of a long inlet and it is nestled amongst mountains as high as 4000 feet. 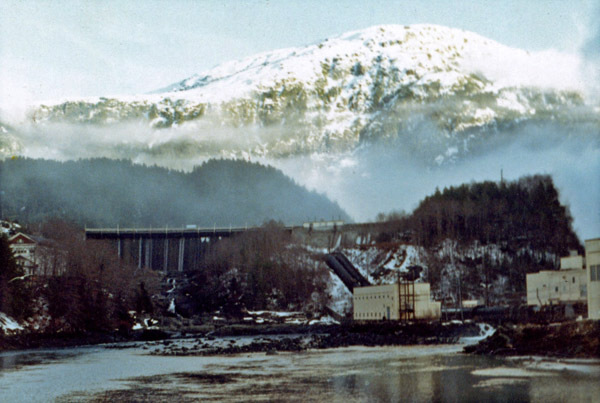 A dam controls the water outfall of a large lake which is fed by rain and snow from the mountains. The natural waterfall which existed prior to the installation of the dam was one of the primary reasons for establishing a large pulp and paper mill at Ocean Falls. The relative inexpensive hydro power and the availability of clean water made the installation of the paper mill economically attractive. The paper mill complex is now demolished. However, the hydro turbines which were an integral part of the original mill still produce electricity to adjacent communities. The purpose of these web pages is not to record history but to reach out to people who once lived in Ocean Falls when the town was a busy paper mill town.